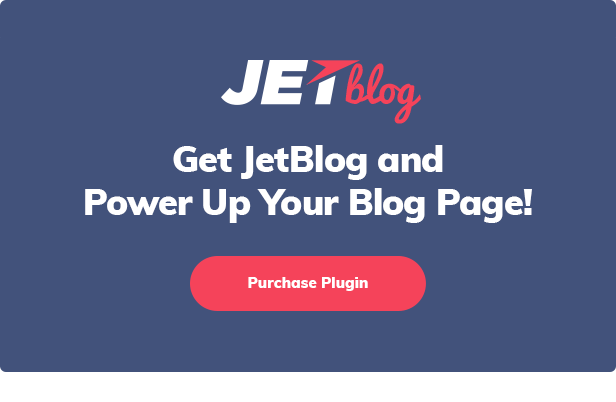 JetBlog plugin is a powerful Elementor addon, which was developed to create outstanding widgets and showcase your posts in the most attractive way. You are able to create and easily customize text tickers, smart tiles and smart lists. 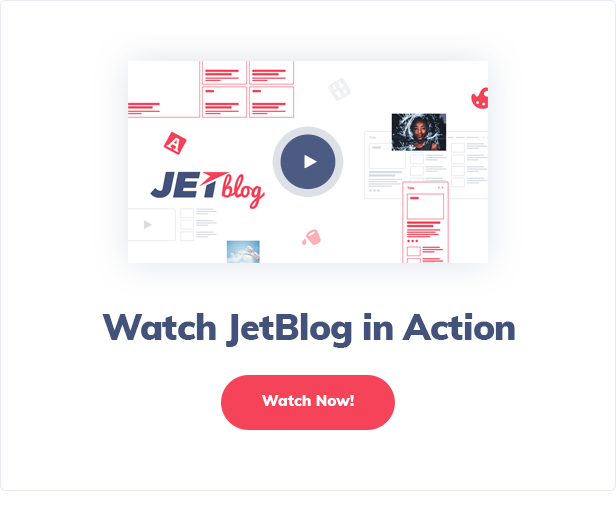 JetBlog plugin allows to create astonishing by adding video layouts, text tickers and many other elements to showcase your website the best way! 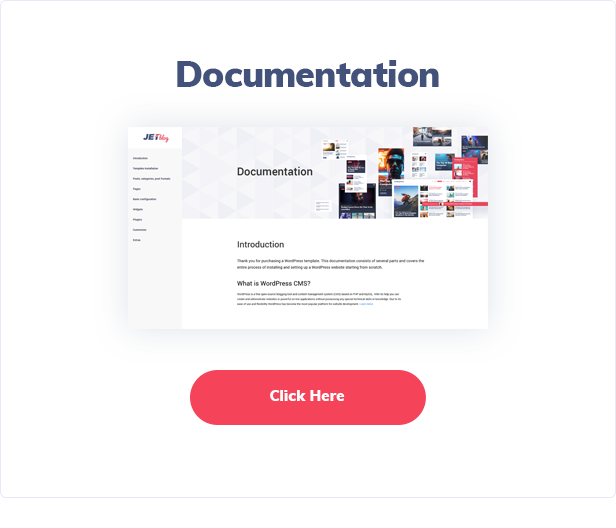 Everyone, from beginner to professional developer, will definitely appreciate JetBlog and its rich and useful functionality. 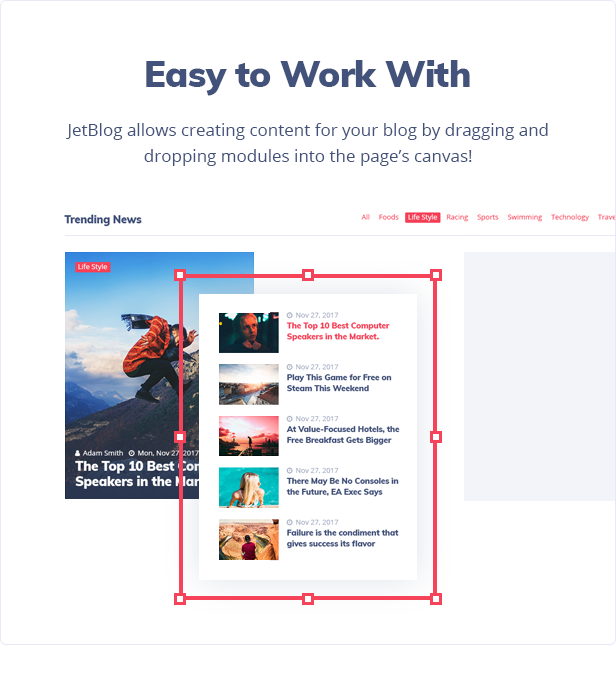 Youâ€™ll be excited about how easy it is to drag and drop content sections and then customize and style them up. Just a few moves and youâ€™ll get your widget! 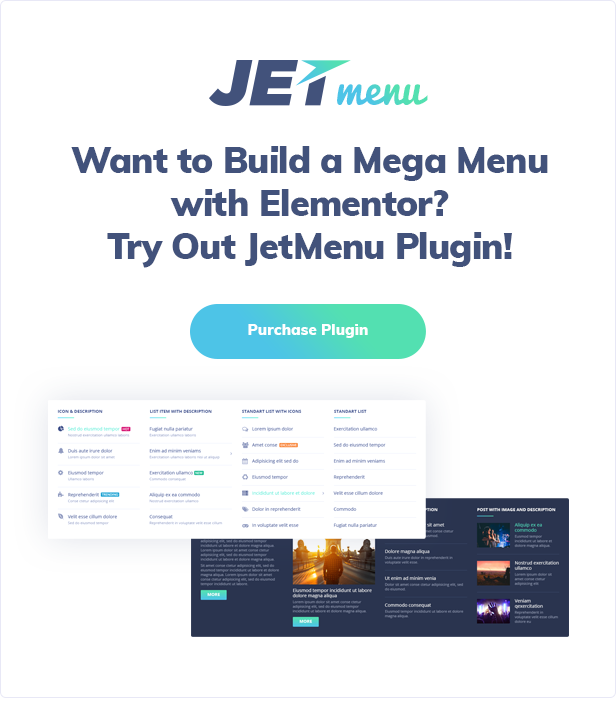 JetBlogs plugin was cut for Elementor and allows to add various dynamic content blocks, such as Video Playlist, Smart Tiles, and may others. Share news with your audience in engaging and simple way! Enjoy creating a constant animated feed of your publications with Text Ticker content module. Create absolutely classy blog posts and showcase them in the most attractive way. 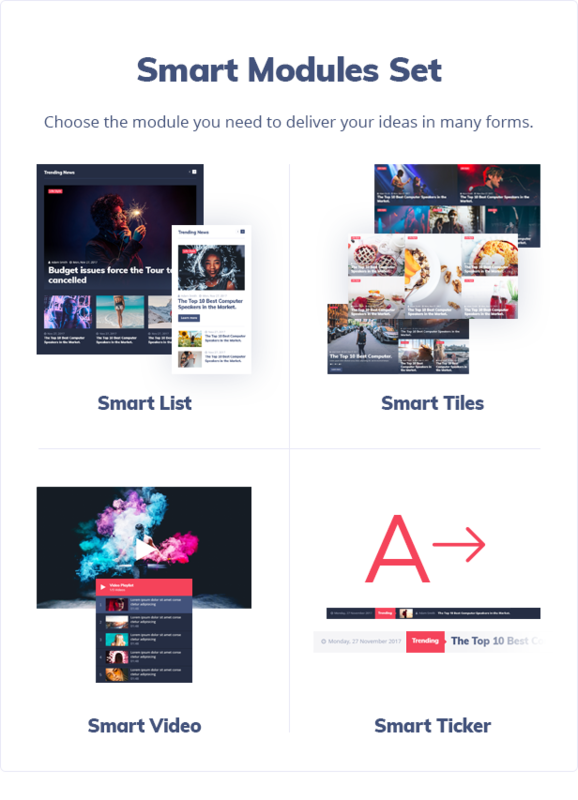 You visitors will appreciate how you used Smart List module, as it gives ample opportunities to make different layouts. 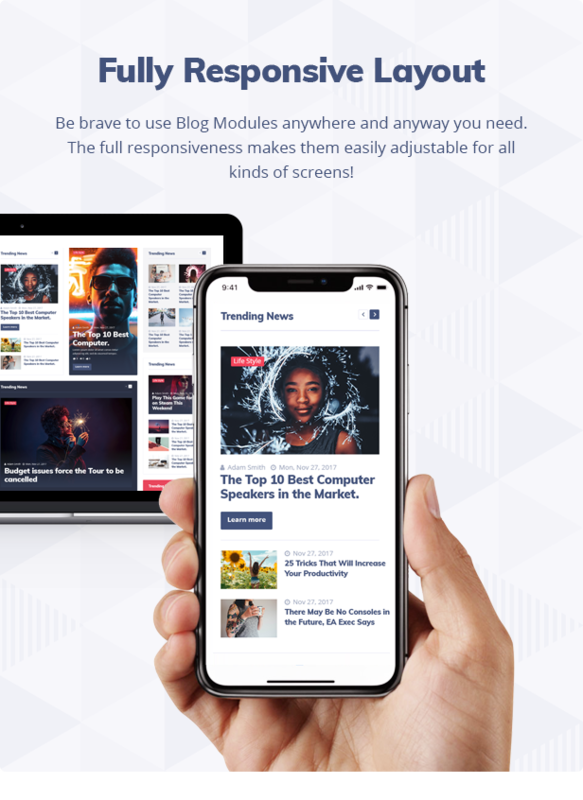 Truly stunning and outstanding Smart Tiles module will make your blog stand out from your competitors thanks to its great settings and rich selection of style options. 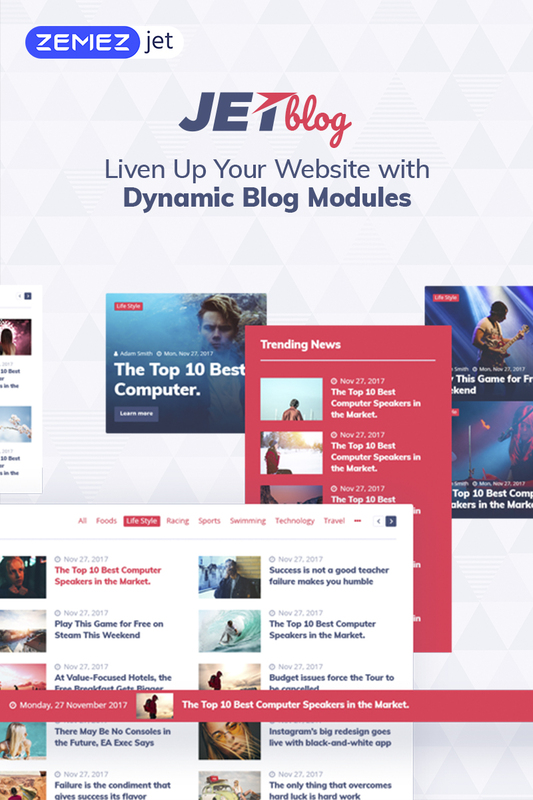 Use Video Playlist module and use all its advantages and and style settings to create absolutely notable content, which will brighten your website! 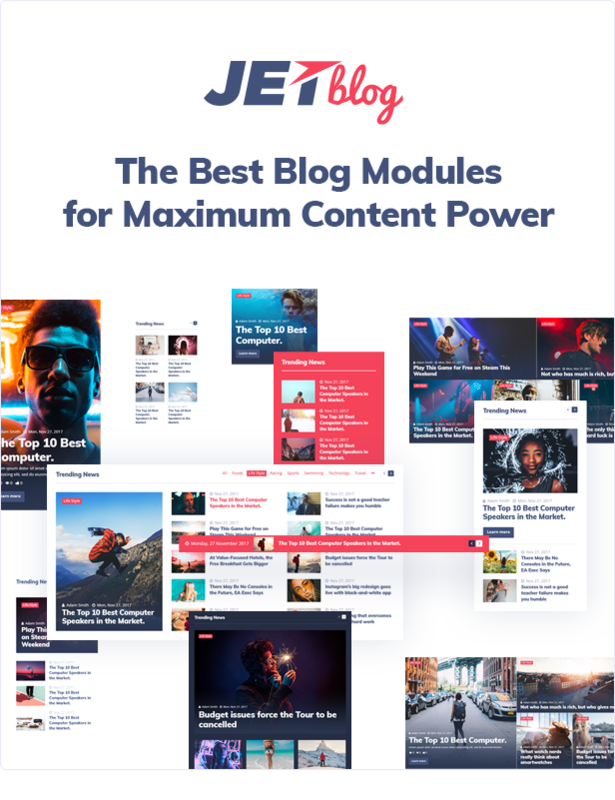 Deep into great selection of layouts and settings available in JetBlog plugin to make your website the most exquisite and distinctive. The plugin with all its filling and versatile settings will look great on screens of any size, from mobile phone to desktop with no worries. Experience all advantages of well-done typography block and its style options. Select your perfect font, change its size, add decoration and choose the most suitable color within several clicks! Easily change text direction from left-to-right to right-to-left! JetBlog supports RTL and meets the needs of people speaking different languages. Good add-on, it does what it says, responsive and highly customizable. thank you. It&#039;s okay. I found it to be useful for building my website, but nothing too essential. Great plugin, helps me a lot to achieve magazine look on my website. Simply amazing plugin! Pay attention tho. Firstly i was thinking it comes with pre-build examples..but it doesnt. 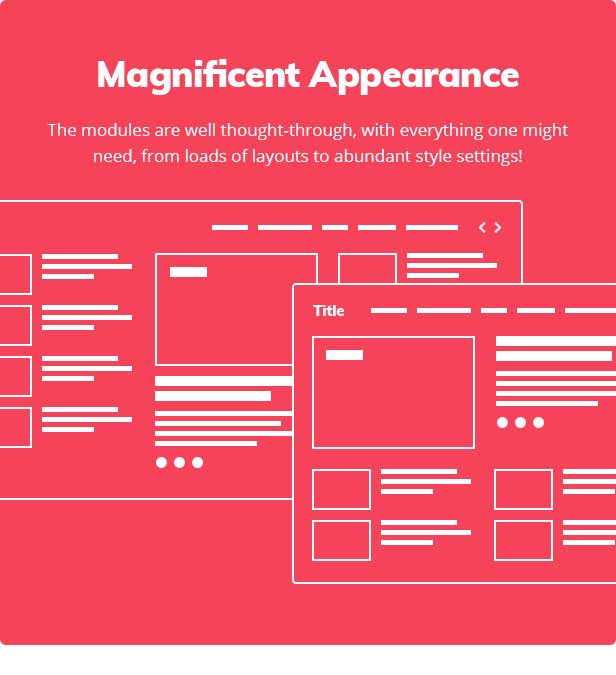 Perfect Blogging Package that includes all necessary widgets for making things more beautiful. 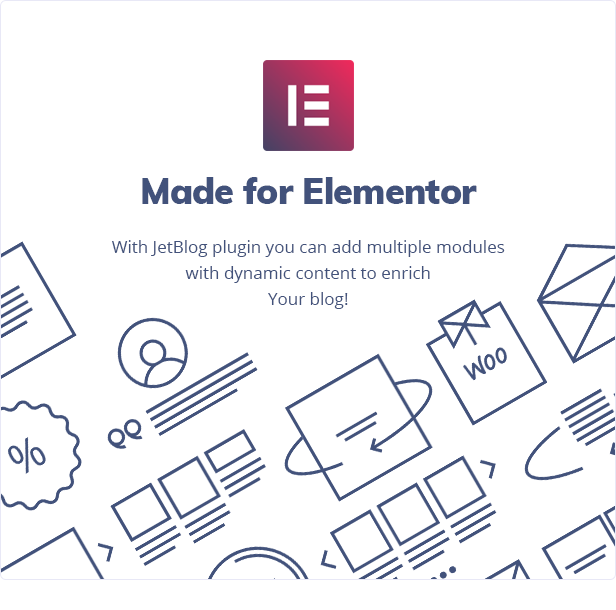 Great functionality and design for the Elementor Page Builder WordPress. - Fixed: Smart tiles layout in IE.